Welcome to the first Gifted Gorgeousness link-up of 2018! The link-up date will continue to be the 15th and I will keep the link-up open until the end of each month so you have plenty of time if you are late posting. is our first winner! I have your address already so there will be something nice on it's way to you soon. At this point I got deja-vu as DJ won last year as well. That's what you get when you take part regularly, you increase your chances of winning! Since my last post I have worked on a few GG pieces. The very centre of the chart is the right hand stitch on the bottom row and the top of the chart is about four rows above the turtle foot I have just started stitching. This picture shows what I stitched over the last four days. The fish took the entire length of The Two Towers extended DVD on Sunday afternoon! A lovely knitted Goth Bunny from Julie! Isn't she lovely? I called her Goth Bunny to start with but then I popped her on the shelf with my badges (my Secret Santa at work bought them for me) and thought maybe she's a Suffragette Bunny? I love her and if Julie links up here she will get double GG points for sending and me receiving a gift! Which brings us nicely to the link-up part of the post. Please use your name or your blog name in the field and NOT the words "January Update" so I can easily see who has linked up this month. And link to the actual post, not just your blog. It is easier if you copy and paste the link, rather than typing freehand. 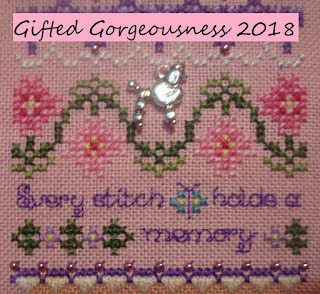 Make sure you visit the linked-up blogs this month, especially Katie Jeremiah's Mom, she is having a Gifted Gorgeousness Giveaway this month. Pop over and see what you could win. Beautiful stitching. I love your bunny no matter her name she is beautiful. Thanks for advertises my blog. I hope to make some people have a reason to participate in this wonderful SAL. The finished 12 Days is beautiful, and your other projects are lovely too. thanks for hosting again. I forgot to say that I would like to be in the Valentine Blog Hop. Congrats to the winners. I am going to try and put in at lease a few stitches so I can do a post. Lovely stitching Jo. Great stitching to admire and a lovely bunny from Julie. Great progress on your GG projects, still love JE's 12 days, so cool you were able to finish that last year! I'm going to have to look if I have any more "love" type projects, I haven't stitched any in a while. Happy to join in the Secret Sweetheart blog hop.. I'm all linked up! You can also count me in for the blog hop, I just need to find some time to stitch up a little something. You made some great progress on your GG projects, especially that map is coming along very nicely. How old is your son now? Lovely stitching, Jo. What a great bunny from Julie. I think she looks like a suffragette. One day I hope to become organized to participate in a blog hop.In the meantime I enjoy seeing all your progress photos and will visit your blog hoppers! Love your Suffragette Bunny! 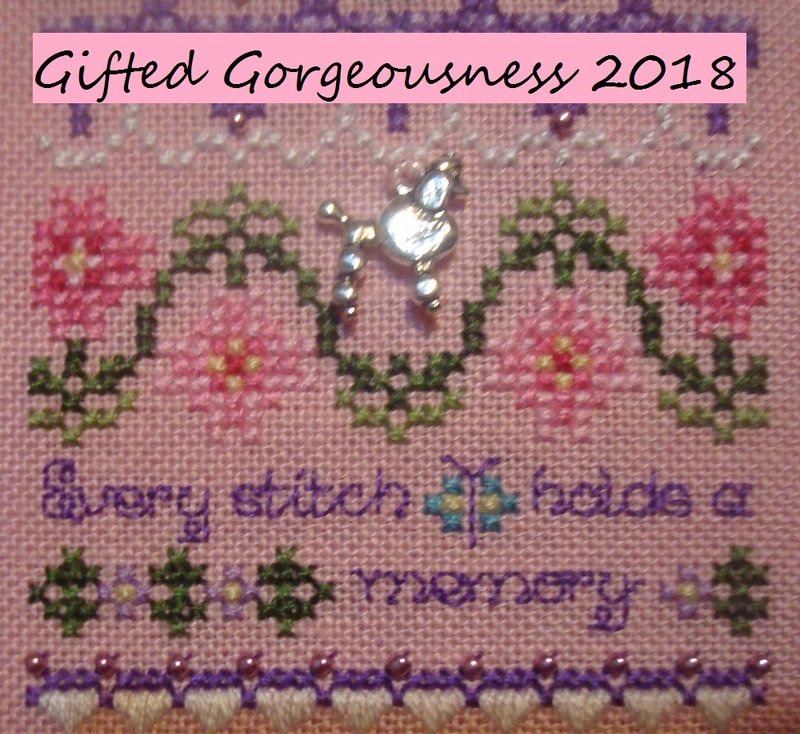 I linked too.My first gifted gorgeousness blog post I am really happy about it.And I am in for the Valentine of course!AriadnefromGreece! Two entries for me please, I just did my post and linked up! Congrats to Jocondine and DJ on their wins for last year. 12 Days is amazing and lots of progress on the Discworld. Ι am in for this blog hop, Jo. I will be back soon. And, of course, I am in for the Secret Valentine! Kisses, my friend. Always love to see your updates - so much progress on so many different things! Don't think I've seen the Discworld map in a while - you've done a huge amount since last I remember. My first comment must have been lost somewhere... I'm back now with my update. Thanks for hosting this Jo! I am glad I could shoe horn my Magi under "Gift", but I need to get something else out so I can have a true GG to post. Some of my fav colors in the 12 days of Christmas by Just Nan. the maps is going to be one interesting project. Forgot to add that the bunny from Julie is such a sweet gift. A little bit late ... but I made it! I am loving your Discworld project! I completely understand about the length of time it took to stitch the fish ... I have a few projects like that - but they are worth the time. Love the adorable gifted bunny, too! So great to see that you started another band sampler by Just Nan. I truelove them and will follow your progress on it this year.